In the midst of the political turmoil that has divided Libya since the Qaddafi era is a religious scholar and academic with a taste for Islamist politics. Grand Mufti Sadiq al-Ghariani is in many ways a product of the turmoil; he was simultaneously praised by the Tripoli-based Islamists while he was sacked from his position by the Tobruk-based House of Representatives (HoR). Though he is often identified as a Salafist, al-Ghariani has often opposed efforts by Salafist militants to eliminate their opposition and force the creation of an Islamic state. As Grand Mufti and head of the Dar al-Ifta, the office in Libya responsible for religious rulings, his fatwa-s are not law, but they nevertheless exert an important moral force in government policy and decision-making. The 72-year-old al-Ghariani was born in Bayda, the capital of Cyrenaica’s Jabal al-Akdhar (Green Mountains) district in 1942. In 1984, al-Ghariani completed a Ph.D. in Arabic and Islamic Studies at Exeter University in England before becoming a Tripoli-based professor of Islamic Studies (Guardian, August 31, 2014). He was one of the first persons of influence to denounce Mu’ammar Qaddafi after the February 2011 uprising began. While professing to be an Islamic leader, Qaddafi had an often contentious relationship with Libya’s Islamic scholars. The Dar al-Ifta was closed by Qaddafi to eliminate criticism of his often unorthodox views on Islam. 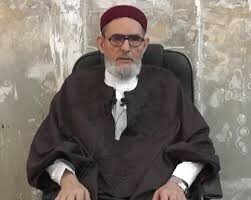 When rebel forces seized Tripoli, al-Ghariani was appointed as the Grand Mufti in a restored Dar al-Ifta by Transitional National Council (TNC) leader Abd al-Jalil in May 2011. After Qaddafi’s death, al-Ghariani announced that the late Libyan leader was an “infidel” unworthy of funerary prayers (Times of Oman [Muscat], April 15, 2012). During discussions over the drafting of a new constitution for Libya, al-Ghariani indicated that a document that did not insist on the primacy of Shari’a in all legislation was contrary, not just to religion, but to reality: “God’s word is supreme. The word and the will of the people is not supreme. If all the people and the popular will agreed unanimously on something that contradicted the word of God, then all the people are wrong and the word of God is right” (Libya Herald, July 20, 2012). With this in mind, in January 2013, Libya’s General National Congress (GNC) began the process of creating a new constitution for Libya that would define Shari’a as the “only source of legislation” (al-Jazeera, January 23, 2013). In December 2013, al-Ghariani urged Libyans to act as a unified force in rebuilding Libya: “Disunity brings nothing but evil and results in weakness, failure and loss, and finally humiliation and shame… We must all realize that we are all in the same boat. If this boat sinks, there will be no survivors” (Libya Herald, December 16, 2013). Following July 7 parliamentary elections, in which Islamist candidates generally fared poorly, Libya found itself with competing administrations, including the Tobruk-based House of Representatives (led by Prime Minister Abdullah al-Thinni and supported by the Zintani militias and the Libyan National Army of Major General Khalifa Haftar) and the now mandate-less Islamist remnants of the General National Congress in Tripoli, led by Omar al-Hassi and supported by the Misratan militias, the Benghazi Revolutionaries’ Shura Council, Ansar al-Shari’a and other Islamist groups gathered under the rubric of “Operation Dawn.” Though al-Ghariani had declared the ultimately victorious National Forces Alliance “un-Islamic” before the election, voters widely ignored him (The National [Abu Dhabi], July 14, 2014). The rivalry between the Tripoli and Tobruk governments intensified when the Tripoli-based Supreme Court declared the Tobruk HoR to be illegal (Libya Herald, November 7, 2014). Al-Ghariani was elated with the Supreme Court’s decision, which he described as a victory over “enemies of the revolution” in a series of congratulatory messages delivered on various television stations sympathetic to the Operation Dawn forces (Libya Herald, November 9, 2014). The Mufti went on to urge the government to reward young Islamist revolutionaries with government jobs and medical treatment. Despite his support in conservative Islamist circles, al-Ghariani is often mocked by his opponents on social media and even endured a rocket attack on his office in Tripoli on June 8. Speculation centered on Khalifa Haftar’s forces for responsibility as the struggle between Haftar and al-Ghariani has become a particularly bitter and personal rivalry. Haftar’s anti-Islamist Operation Dignity was attacked by al-Ghariani in May as “an attempt to impose political views by force of arms,” driving the nation into a state of chaos and disorder (Libya Herald, May 22, 2014). More recently, al-Ghariani used a live TV broadcast to assure viewers that the creation of a new military under the leadership of Omar al-Hassi’s Tripoli government would “save us from the lies spread by the national army led by Haftar which kills us in the east and the west”(al-Ahrar TV [Doha], November 19, 2014). Describing a series of assassinations of former security officials of the Qaddafi regime in Benghazi as “heinous crimes” regardless of their motive, al-Ghariani issued a fatwa in August 2012 that declared “It is not permissible in our religion for an individual or party to kill a person in cold blood” (Libya Herald, August 16, 2012). He reemphasized his views following the April 23, 2013 bombing of the French embassy in Tripoli when he declared the bombing was “contrary to the teachings of Islam… We must never forget that almighty Allah and His Messenger forbid the killing of ambassadors, messengers, custodians and covenanters, as well as the killing of Muslims” (Libya Herald, April 30, 2013; Reuters, April 23, 2013). What some armed people do in digging up graves by force and removing their remains is not permissible under Shari’a, and is not suitable as far as customs are concerned, because this involves violation of the sanctity of the dead and of their relatives who are still alive… This is clear: what people are now doing in terms of digging up old graves and demolishing mosques is contrary to the Sunnah and the sayings of scholars. This prohibition about digging up graves includes non-Muslims’ graves as well. There were non-Muslim graves in Madinah and other Muslim cities that were conquered, but neither the Prophet nor any of his companion issued orders for their removal. It is the duty of the state to preserve security and to prevent all those who sow commotion and stir troubles. The use of weapons by any group, for any reason whatsoever, is an assault on the legitimacy of state and an illegal act that would divide the group (Magharabia, August 27, 2012). Since assuming the role of Grand Mufti, al-Ghariani and the Dar al-Ifta have been very active in issuing fatwa-s on a wide range of subjects, often in response to requests for rulings on these issues. • In March 2013, al-Ghariani urged legislation to reinforce his ban on Libyan women marrying foreigners. The Mufti claimed that Druze and Shi’a Muslims from Syria and Iran were taking advantage of Libya’s political turmoil to enter the country and use intermarriage as a means of introducing their unorthodox religious doctrines to Sunni Libya (al-Arabiya, March 28, 2013). More importantly, al-Ghariani issued a fatwa in the same month that many Libyans and outside observers saw as confirmation of the Mufti’s misogyny when he condemned the release of the UN Report on Violence against Women and Girls, claiming it advocated “immorality and indecency in addition to rebelliousness against religion” (AP, March 11, 2013). • In October 2013, al-Ghariani responded to a request from the Ministry of Education for a ruling after learning some schools were ordering female teachers to cover their faces at work. The Mufti’s fatwa declared that female teachers must wear the veil when instructing males who have reached puberty and included a suggestion that segregation of males and females in all schools would provide the ideal solution (VOA, October 15, 2013). • On December 22, 2013, al-Ghariani’s Dar al-Ifta office declared that Shari’a must be the main source of legislation in Libya and that any law drawn up outside the boundaries of the Shari’a would be automatically void (Libya Herald, December 25, 2013). • In a January 2014 decision ultimately derived from a fatwa originally issued by Salafist Islam’s most influential scholar, the 12th century’s Ibn Taymiya, al-Ghariani condemned the celebration of the mawlid (the Prophet’s Birthday) as a 12th century Fatimid Shi’a innovation (bid’ah) unsanctioned by either the hadith-s or the Quran. The occasion has traditionally been very popular in most parts of North Africa and the Mufti’s fatwa was rejected by most Libyans, who turned out in large numbers to celebrate the next mawlid (Libya Herald, January 13). • On January 23, al-Ghariani insisted Libyan revolutionaries must, in the absence of effective state power, eliminate alleged Qaddafi loyalists in Warshefana and Sabha: All those who failed to do so or took up this task in a half-hearted way was a deviant from Islam “Revolutionaries must besiege these criminals and eliminate them so as to prevent injustice, immorality and corruption prevailing in the land of Libya and in order that our revolution is not in vain in the face of the acts of these gangs and outlaws, which are contrary to the teachings of Islam” (Libya Herald, January 24; Deutsche Welle, February 5). • In April, the Mufti sought to reverse the gradual emancipation of Libyan women during the Qaddafi regime by calling for an end to mixed education and employment. The fatwa coincided with an Islamist campaign to have Libya’s female judges and lawyers (roughly half the number of legal professionals in Libya) to be restricted to cases of family law. In May, the Mufti wrote Libya’s prime minister to persuade him to impose a ban on “lewd” lingerie and undergarments for women (al-Wafd [Cairo], May 3). • On June 9, the Grand Mufti appeared on television to deliver a fatwa calling on Libyan Muslims to fight the army and police (especially those serving under General Khalifa Haftar, whom he described as “infidels”) while denying the radical Ansar al-Shari’a movement was a terrorist group: “There is no terror in Libya and we should not use the word terrorism when referring to Ansar al-Shari’a. They kill and have their reasons. Those among them who have died are martyrs” (al-Wataniya TV [Tripoli], June 9, 2014; Magharebia, June 12; Middle East Eye, June 12, 2014). • During the July Israeli assault on Gaza, al-Ghariani declared it was obligatory for all Muslims to support the people of Gaza in their encounter with the Zionist “killing machine.” The Mufti went on to accuse Arab governments of providing political and material support (such as fuel) to Israel and its military (Middle East Monitor, July 10, 2014). • In September, the Grand Mufti issued a fatwa banning the use of credit cards issued by the Aman Bank of Tripoli as their interest fees contradicted an Islamic injunction against usury (Libya Herald, September 29, 2014). • In October, following a series of armed takeovers of Libyan oil facilities, energy plants and ports, al-Ghariani issued a fatwa in which he said no individual or group had a right to disrupt vital public services, adding that the “outlaws” involved in such activities needed to be smashed “with an iron fist” (Libya Herald, October 2, 2014). Al-Ghariani quietly entered the UK on a private visit in April 2014 and spent several months there, possibly receiving medical treatment (Guardian, October 30, 2014). Working out of an Exeter home owned by a relative, Sohayl al-Ghariani, the Libyan Mufti began to issue YouTube broadcasts through Sohayl’s Arabic-language Tanasuh TV network calling for the destruction of the HoR government in Tobruk by Islamist fighters (Sunday Telegraph, August 31, 2014). When a local investigation began into the Mufti’s activities in England and the UN began considering filing war crimes charges against him for inciting violence in Libya, al-Ghariani fled to Qatar and then Turkey before an eventual return to Tripoli (Guardian, September 1, 2014). Once back in the capital, al-Ghariani addressed a large gathering in Martyr’s Square, condemning the HoR and saying that anyone who failed to support Operation Dawn should be punished (Libya Herald, September 14, 2014). Al-Ghariani was summoned to explain his remarks to the HoR, but refused to make the trip to Tobruk. Only days after his return to Libya in mid-September after over four months abroad, it had become clear that the House of Representatives had already made a decision to sack the Grand Mufti, though official action was delayed as there were questions regarding the legal basis for the decision and what individual or institution would replace the Mufti and his office. There were also calls in the HoR for Libya’s attorney-general to indict al-Ghariani for incitement to murder (Libya Herald, September 14, 2014). Even people who are non-literate and not learned in religious studies are aware that these fatwa-s are not consistent with the Islamic religion but are rulings that serve specific political purposes. Thank God the Libyan people are conscious and aware of these fatwa-s. No Libyan citizen relies on these edicts nor do they mean anything at all to them. These edicts concern the Grand Mufti personally and those around him. Any person who issue such fatwa-s bears their responsibility on Judgment Day because these fatwa-s are falsehoods and unjust. We have never heard at all in the world of a Mufti of a state that preaches killing. This has never happened in history. This Mr. Sadiq al-Ghariani preaches fatwa-s in public and even those who do not know anything of religion cannot accept and do not believe in them and, therefore, these rulings are rejected by the Libyan people, who know right from wrong” (Libya Herald, October 18, 2014). On November 9, 2014 the HoR voted to sack al-Ghariani and dissolve the Dar al-Ifta, the national fatwa-issuing authority. However, the move was unlikely to have much impact as the Tripoli-based Mufti is beyond the HoR’s control and does not recognize the authority of the HoR (Libya Herald, November 9, 2014). For now, al-Ghariani continues as the rump GNC-approved Grand Mufti, though there are signs his influence, particularly in his occasional efforts to restrain Libya’s political violence, is beginning to wane even amongst his Islamist supporters. However, at this time, Libya’s political struggle between Islamist and anti-Islamist trends has taken on a life of its own and is unlikely to be largely affected by al-Ghariani or any potential replacement as head of Dar al-Ifta. A fatwa-issuing Grand Mufti has an important role in a peaceful Islamic society, but has difficulty influencing political outcomes once young gunmen take to the streets to impose their own vision of the future. 1. Ronald Bruce St. John, Historical Dictionary of Libya (5th ed. ), Lanham MD, 2014, p.20.